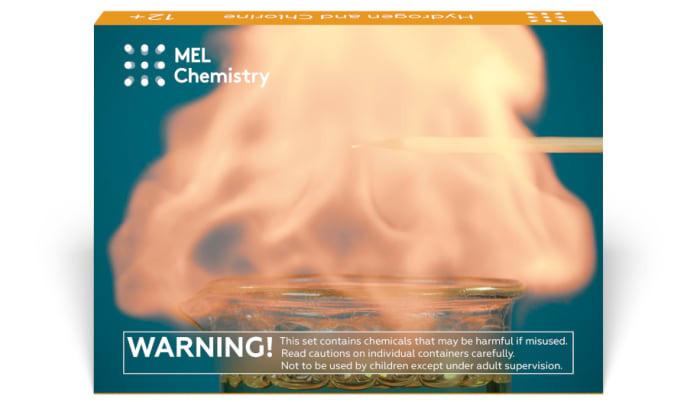 This experiment is included into "Hydrogen and Chlorine" kit along with "Chlorine". Subscribe and get everything you need to do this experiments at home. Remove protective gloves before lightning the candles (step 5). 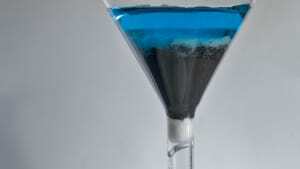 What do we add glycerol for? Glycerol is used to stabilize the foam. Foam is not forming. Why? Perhaps, you didn’t use enough of liquid soap and glycerol. Try adding 10 more drops of each solution. Hydrogen doesn’t ignite. What should I do? First of all, check that the hose is fit snuggly into the rubber stopper, and the stopper is secured in the flask, because there has to be no gaps for gas to leak through! 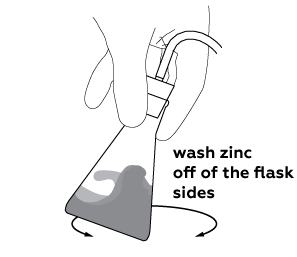 Now, gently swirl the flask to wash off zinc from the flask walls, then drop the end of the hose into the solution, and wait for couple minutes. Try igniting the foam one more time. Why don’t we take the hose out when igniting the foam? The amount of produced hydrogen is enough to ignite the foam several times. The hose isn’t damaged in any way when we ignite foam, so it is better to leave it in the solution to avoid loss of hydrogen. Let’s prepare some soap solution. To make the soap bubbles more stable, add some glycerol. Prepare the hydrogen generator parts. Sodium hydrogen sulfate gives off a lot of ions H+ into the solution. Zinc reduces these to molecules of hydrogen H2. The produced hydrogen goes straight through the silicon tube into the soap solution. Soap bubbles with hydrogen inside don’t burst and hydrogen foam fills the beaker. When ignited, hydrogen rapidly reacts with oxygen. This process is called combustion. Some of the zinc powder stays on the flask sides. To speed up the production of hydrogen add the zinc back to the solution. 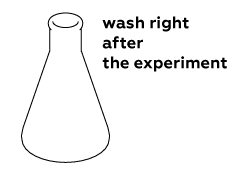 Wash the flask right after you finish the experiment: the reaction mixture is very adhesive and will be harder to wash off later when it dries. Dispose of the reagents together with household waste. Pour solutions down the sink and wash off with excess of water. A zinc atom reacts with two hydrogen ions by donating one electron to each of them. As a result, zinc becomes charged and passes into solution in form of an ion Zn2+. Neutral (with a zero charge) hydrogen atoms cannot stay in isolation for long as they are extremely reactive. At the earliest opportunity, they couple into pairs to form a stable hydrogen molecule H2. Such molecules are poorly soluble in water, and so they promptly escape in form of bubbles. 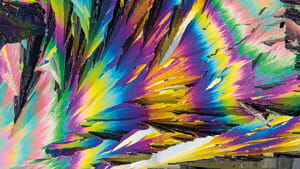 A reaction of zinc with acids is a common method for obtaining hydrogen in a laboratory. There is even a special instrument for conducting such chemical reactions – Kipp’s apparatus, which has been invented in the middle of 19th century. Generally speaking, Kipp’s apparatus is an “advanced” version of a system we use in our experiment. When hydrogen is being synthesized in a Kipp’s apparatus, granulated zinc in the middle reservoir reacts with concentrated hydrochloric acid (HCl) or diluted sulfuric acid (H2SO4). This process produces hydrogen gas. Next, hydrogen is released via a lateral outlet with a valve on it, to the outside where it can be collected and routed for further use. An advantage of a Kipp’s apparatus, compared with our hydrogen production setup, is that we could close the valve to stop the reaction: released hydrogen pushes acid out of the middle reservoir, and the reaction cannot proceed. When the valve is opened, the process starts over again. Interestingly, a principle of Kipp’s apparatus is based on a design of Döbereiner’s lamp, the first real lighter. In a Döbereiner’s lamp, a zinc plate reacts with sulfuric acid yielding hydrogen that accumulates in an airtight vessel. When a valve is open, the gas is rushed to the outside where it passes through a porous platinized asbestos plate. The latter initiates ignition of hydrogen in air: metallic platinum Pt dissolves hydrogen and promotes its reaction with oxygen. Finally, when the valve is closed, the gas accumulates in the vessel and pushes the acid away from zinc, thus, ceasing the reaction. Kipp’s apparatus can also be used for obtaining other gases, for example, carbon dioxide CO2. In this case calcium carbonate CaCO3 reacts with diluted acid (for example, hydrochloric acid HCl), giving carbon dioxide CO2 and calcium chloride CaCl2. You can see how this reaction is performed with the help of Kipp’s apparatus in the video below. Why do we add glycerin to the soap solution? Glycerin makes foam bubbles stronger, so that they can safely keep hydrogen inside. This effect is due to glycerin ability to form additional hydrogen bonds, which increases viscosity of the soap solution. By the way, what is hydrogen bond? It’s what they call a weak interaction causing attraction between certain chemical groups in a molecule. Though, this attraction doesn’t result in the formation of a true chemical bond. 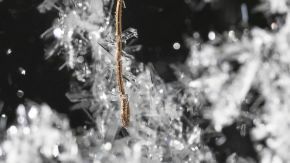 However, such interaction keeps water molecules together, ultimately making water liquid. A hydrogen bond is called so because of hydrogen that participates in this kind of interaction. Importantly, a participating hydrogen atom must already have a polar bond with another element, such as oxygen (“O–H” bond) or nitrogen (“N–H” bond). A polar bond is a bond formed by two different elements, one of which withdraws electrons towards itself stronger than the other. Here, “O–H” and “N–H” bonds are a classic example, where oxygen and nitrogen “pull” the electrons. So, the second participant of a hydrogen bond is usually a nitrogen or oxygen atom (and sometimes fluorine). Moreover, these atoms must also be a part of a molecule where they already participate in a polar bond. Finally, when all of the criteria are met, these potential participants form hydrogen bonds between each other. These hydrogen bonds are about twice longer than bonds interconnecting atoms within a molecule. Subsequently, it takes roughly 10 times less energy to break a hydrogen bond than to break, for instance, an “O–H” bond in a water molecule. Hydrogen bonds are formed not only between adjacent molecules. Indeed, thanks to this type of interaction, life on Earth is possible as it is today. It isn’t just about keeping water in a liquid state that prevents oceans from evaporating. In all living organisms, any protein can only work when its molecule, which consists of long chains of atoms, is folded into its correct geometrical shape. And it is hydrogen bonds that form between the sections of this chain to help them “roll” into proper configurations. Moreover, hydrogen bonds play a key role in formation of a DNA structure, the main carrier of information in a living organism. In our experiment, glycerin is needed to form three (!) hydrogen bonds to make liquid more viscous. Thanks to increased viscosity, bubble walls become less “runny,” which in turn makes bubbles last longer. Using glycerin, we can make a composition for blowing big and quite stable soap bubbles. 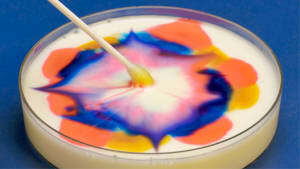 To do so, simply mix dishwashing liquid or liquid soap with water and glycerin. Keep experimenting with ingredients ratio to create huge bubbles! Keep in mind, though, that moderation is more satisfying than excess: amount of glycerin added should not exceed 10% by volume. When too much glycerin is added, the resulting liquid will be too thick and viscous, making it hard to work with, and the bubbles will be heavy and fragile. Why is it so easy to ignite the hydrogen soap foam? However, the reaction, which looks so easy from the first sight, in fact is a much more interesting and complicated process. Let’s take a short trip into the reaction mixture under 100 000 000 magnification to see what happens during the explosion! 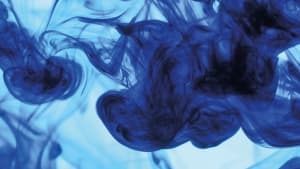 Perhaps, you’ve heard about oxyhydrogen or “knallgas,” which means “bang-gas.” It’s a mixture of 2:1 mixture of hydrogen and oxygen. When mixed at this exact ratio and then ignited, these gases react instantly with explosion due to release of enormous amount of heat. Because of this heat, which is swiftly transferred to the gas, the latter promptly expands in a reaction zone forming an explosion wave. 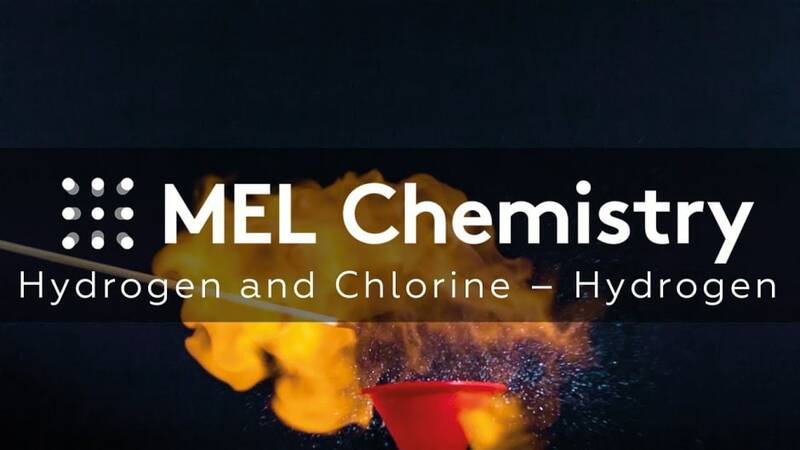 Due to a high risk of detonation, any work with air-hydrogen and oxygen-hydrogen mixtures requires wearing safety glasses and a presence of a second person to provide help if needed. In our case, however, the volumes are too small to worry about. There is no danger to an experimenter. Nevertheless, do observe common safety rules: put away flammable materials and work with open fire carefully. However, if you still want to know what will happen in case of explosion of higher volumes of hydrogen, for example, a hydrogen filled balloon, watch the video below! But remember: never repeat it at home!